Prime Minister Dr. Ralph Gonsalves stated that this was achieved at a period when critics have been failing to see the benefits which can be derived from the programme and have been calling for St.Vincent and the Grenadines to withdraw from the agreement. Gonsalves stated that under the loan agreement, St.Vincent and the Grenadines has 15 years to make its repayment, plus a five year grace period. The loan will be repaid at three per cent interest. âIt donât get better than that,â quipped Gonsalves who applied for the loan last December while attending the ALBA summit in Cuba. The prime minister said he will draw down US$25 million this month and the other US$25 million in March. 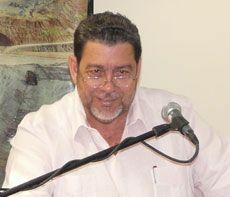 âThe Ministry of Finance officials have advised me that a loan so soft amounts, in effect, to 70 per cent grant,â said Gonsalves. He disclosed that he intends to put US$20 million of the monies towards the international airport project and US$30 million to the Central Government. The prime minister used the opportunity to express his gratitude to the governments of Venezuela and Cuba.